born circa 1878 in Mexico. is buried in Holy Angles Cemetery. Was he? the daughter of Paz Gonzalez and Jesus Herrera. Juan Molinar married Zenaida Gonzalez circa 1906.
born 19 Jan 1907 in Presidio County. buried in the Terlingua Cemetery (his grave is marked). born circa 1909 in Texas. She married Jose Del Toro. After his death, she married Faustino Navarro. There were no known children of either marriage. born 4 Mar 1910 in Texas (probably Terlingua). baptized 26 Apr 1910 in Chisos on by Father Brocardus. godparents were Patricio Dominguez and Ursula Rodriguez. born circa 1912 in Texas (probably Terlingua). married Ezequila Hernandez, born circa 1920 in Terlingua de Abajo. 5. Daughter Eulalia Molinar, born 3 Apr 1914 in Terlingua. She died in Brewster Memorial Hospital, Alpine on 5 Apr 1990 and is buried in Holy Angels Cemetery. She married Gonzalo Rodriguez. They had no known children. 6. Son Juan G. Molinar, born circa 1915 in Terlingua. 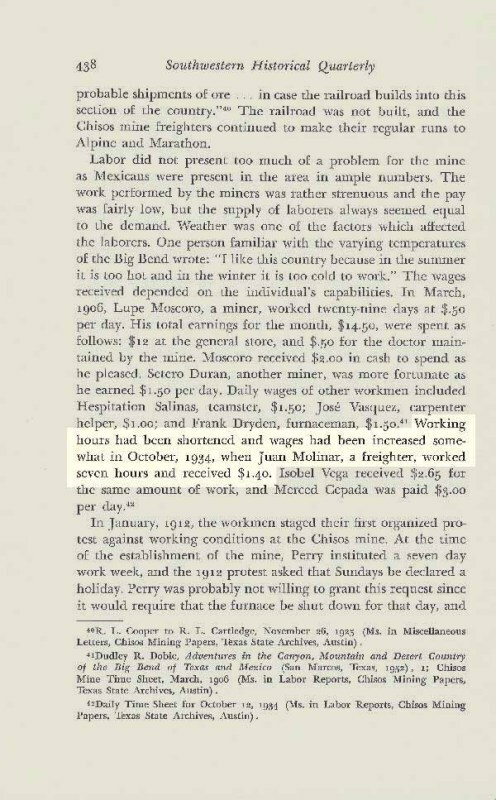 He married Josefina Hernandez, born circa 1923 in Terlingua de Abajo. She was the daughter of Guadalupe Hernandez and Teresa Baeza. They had four children. Is this the one? Was he? 7. Son Enrique Molinar, born 20 Jun 1918 in Terlingua. He died in Medical Center Hospital, Odessa, and was buried in Holy Angels Cemetery with full military rites (WW II veteran). 8. Son Filberto G. Molinar, born 1919 in Terlingua. He died in Hospice House, Odessa, on 21 Oct 2002 and was buried in Sunset Memorial Gardens, Odessa. He married Jesusita “Susie” Jaquez. They had two known children. 9. Daughter Zenaida Molinar, born circa 1922 in Terlingua. Her married name is White. 10. Son Frederico “Fred” Molinar was born 7 Jul 1923 in Terlingua. He died in Hospice House, Odessa, 16 Jan 2005 and was buried in Holy Angels Cemetery, Alpine. He married Angela “Lillie” Gonzalez in 1951. 11. Son Roberto Gonzalez Molinar was born 8 Aug 1925 in Terlingua. He died in Methodist Hospital Center, Odessa, on 17 Jan 1998. He was buried in Rose Hill Cemetery, Odessa. He married Leonarda “Lee” Sanchez in Carlsbad, New Mexico on 3 Apr 1951. They had seven children (names available upon request). 12. Son Samuel Molinar, born circa 1927 in Terlingua. 13. Son Herminio Molinar, born circa 1930 in Terlingua. The Paz Molinar home is in the foreground. Cynta de Narvaez is to the right next to the ruins of a truck. 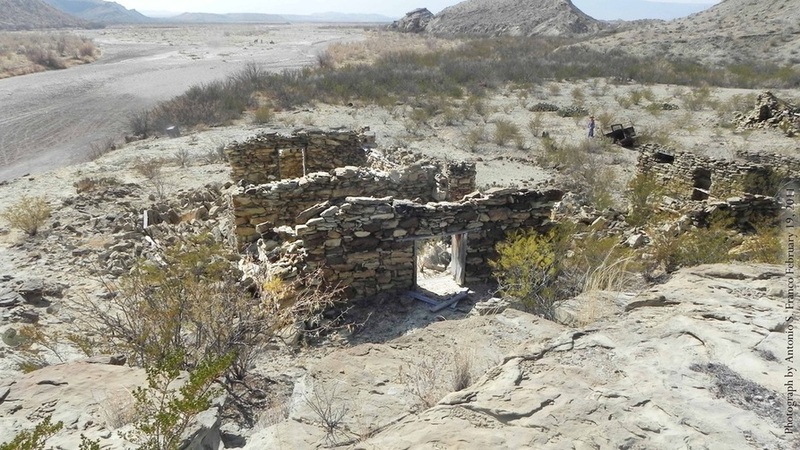 Terlingua Creek runs along the left side of the photograph. At the top of the photo in the center is the hill with a tilted top which is where the Molinar school was located. It was two miles from the Paz Molinar home.